The crisis in Haiti can be followed nearly moment-to-moment online through sites for news coverage and those of relief efforts. Below you can find out where to get news from traditional and non-traditional sources; more on Haitian history; perspectives on the Pat Robertson/Haitian Vodou controversy; and links to relief organizations. The January 22, 2010 episode of the JOURNAL presented Danielle Legros Georges "Poem for the Poorest Country In the Western Hemisphere" read by Public Affairs Television's Kamaly Pierre (pictured). Read more of Georges work. Oh poorest country, this is not your name. the old folks stitch together the island�s shifting colors. this and the lost country. We are going back they say. of our blood abroad. We write the dead who return amid clouds. To the living we rain our green love in letters post-marked by birds. into pieces on airplanes. Three new skies suffocate my old clouds. My soil grows anemic. It whispers to me: Return. The ascent can be nitrogened with quick bubbles to the blood. is a salted plain whose dust reveals an army of cactus soldiers. to the city of nine million gods. A camionette of color cries by. I count the carried. I count the hills. I count the buried. The living sweep by with their tongues in baskets. sweep by with their canes and dusty shoes, their brooms and mango fransik. and sunglasses of the dead. The returned sweep by with dirty hair. Now, how can I give you up, my mother�s earth, my alpha tongue? Copyright � 2001 by Danielle Legros Georges. Reprinted with permission by Curbstone Press, an imprint of Northwestern University Press. Danielle Legros Georges is the author of a book of poems, MAROON. Her work has appeared in literary journals including AGNI, CALLALOO, THE CARIBBEAN WRITER, BLACK RENAISSANCE NOIRE, and has been widely anthologized. She teaches at Lesley University and lives in Boston. As commentator after commentator has noted, Haiti's history is an extremely troubled one. The written history of Haiti begins with the fateful landing of Christopher Columbus on the island, which he named Hispaniola, in 1492. That "discovery" of America signaled demise for the island's native population, and soon, to Haiti's place as one of the largest slave colonies in the Caribbean. In 1697 Spain ceded the western part of Hispaniola to France. A little over a hundred years later in 1801, Haiti became the scene of one of the most successful slave revolts in the Western Hemisphere. Led by the charismatic Toussaint L'Ouverture, a former slave who had been inspired by the French Revolution, a string of military victories led L'Ouverture to be nicknamed by some "The Black Napoleon" (as well as "Black Spartacus" or "Moses of Haiti".) Ultimately betrayed and captured during negotiations with the French, his successor in the rebellion, Jean-Jacques Dessalines, led the island to independence in 1804. The Haitian rebellion terrified slave-importing and owning societies like the United States. 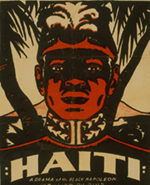 L'Ouverture remained an important symbolic leader among Haitians and societies seeking liberation for generations. As rulers and battle came and went in the next centuries  Haiti's history of the rebellion remained center stage as in the "Chant National" by 19th century statesman and poet Oswald Durand: "When our forefathers broke their shackles, it was not to stand idly. Slaves embraced, body to body, their demise. Their blood, afloat, fattened our hill. It's our turn. Yellow and black let us go! Dig the ground bequeathed by Dessalines!" In the early 19th century the United States began a troubled century of military and financial involvement in the country  invading in 1915 to combat black-mulatto friction which was thought to endanger US property and investments. Troops stayed until 1934, and some level of financial control was maintained by the US until 1947. After Francois "Papa Doc" Duvalier seized power in a military coup in 1956, Haiti suffered under the brutal dictatorship of Papa Doc and his son Baby Doc for nearly thirty years. A series of coups, democratically-elected governments and US and UN interventions followed  and Haiti continually ranked as the poorest country in the Western Hemisphere. PBS "Wide Angle: Haiti, Unfinished Country"
PBS "Africans in America: Toussaint L'Ouverture"
Pat Robertson's now notorious blaming of the Haitian earthquake on a "pact with the devil" has been condemned by scholars and religious leaders alike. 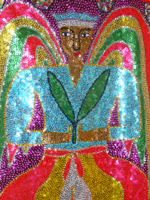 It reflects a deep ignorance about the Afro-Creole religion known in Haiti as Vodou. A mixture and outgrowth of the beliefs brought by African slaves and the Catholicism of their owners, in 2003, the Haitian president signed a decree which made Vodou a "fully recognized religion." Learn more from the links below. "Opinion: Pat Robertson, Haiti and the devil, Part I," Jim Denison, Associated Baptist Press, January 14, 2010. "Haiti and the Pat Robertson Paradox," Jeffrey Weiss, Politics Daily, January 21, 2010. There are thousands of twitter feeds related to the quake and relief effort. Messages come in at the rate of several hundred a minute. View images from the ground through the Haiti flickr group. "When the Media is the Disaster," Rebecca Solnit, CBS News, Jan. 21, 2010. "Why the US Owes Haiti Billions - The Briefest History," Bill Quigley, The Huffington Post, January 17, 2010. Site for the telethon effort. A list of groups compiled by the PBS NEWSHOUR. The site contains a map with state-by-state contacts for Haitian consulates. The JOURNAL assesses Obama's first year as President in the wake of Democrats' defeat in Massachusetts' special election for Senate with Princeton politics and African American studies professor Melissa Harris-Lacewell and journalist Eric Alterman. Faced with the increasing global demand for oil and the threat of climate change, experts say that America needs a new energy policy  but what are our options? Bill Moyers sits down with analysts Jean Johnson and Scott Bittle to discuss how we can power America's future. Find out where to get up-to-the-minute information on the situation and relief efforts online. And, read more from poet Danielle Georges.